Vicki Jones doesn’t think the story of her conversion to Christian Orthodoxy is a particularly entertaining one, but, as any convert knows, conversion to Orthodoxy is a personal journey. The “seed” to search for where we came from and where we belong is God given within each one of us. At some point in our lives that seed germinates and begins to grow when we start asking questions about our purpose here on earth. Curiosity overflows into inquiry and opportunity to learn seems to materialize all around us. This began Vicki’s journey inward. Vicki wasn’t raised in any particular christian denomination even though her mother belonged to the Church of Christ and her father was raised Baptist. They did not worship as a family. Vicki’s teen years were spent exploring all aspects of spirituality without atonement. Vicki’s life progressed in an ordinary way, marriage, children, work without knowing God until one day a co-worker mentioned that she had read about an Orthodox monastery nearby and asked if anyone knew anything about this monastery? Call it coincidence, luck or Divine Intervention another co-worker of Vicki’s just happened to be a subdeacon at the monastery in question. Vicki jumped at the opportunity to question him about the Orthodox faith. Three months of discussion ensued. Bear, the subdeacon, was scheduled for ordination. Vicki was excited to attend. 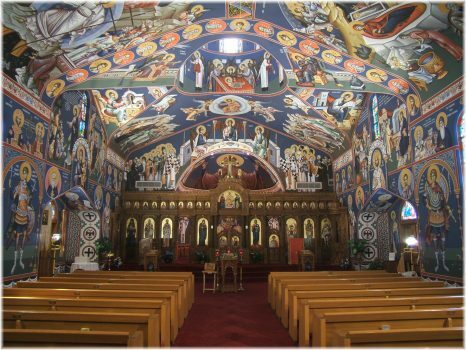 Orthodox services are like no other christian service maintaining ancient roots spanning over two thousand years. It is truly like stepping back in time and can be overwhelming if not mentally prepared. Candles, icons, incense and chanting besiege the senses rendering an “other worldly” experience. Vicki’s heart, mind and soul were ready to receive the beauty and opportunity to develop a closer relationship to God through the Orthodox faith. She immediately became a catechumen. Vicki’s personal life presented numerous challenges resulting in divorce, quitting her job and moving her children and herself to another town. But this time she leaned on God to guide and help her navigate these challenges. When the dust settled Vicki was thriving in a new town with a new job and her girls made the adjustment beautifully. Vicki and daughters were Chrismated and Baptized into the Orthodox faith on December 22, 1996.